The dirt and gravel at the Baharka displacement camp in northern Iraq will turn to a sea of freezing mud in the winter rain. 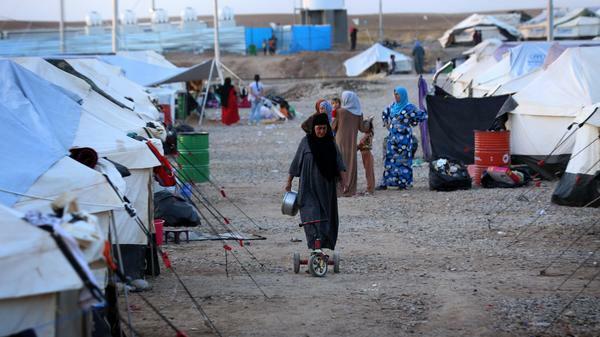 Aid workers say they don't have enough blankets and winter clothing for all those displaced by the advance of ISIS. Leeza Guerges and her family were displaced from a Christian town near the northern city of Mosul when ISIS took the city about two months ago. Iraqis at the Baharka camp for displaced people face real danger as the winter approaches with sub-zero temperatures. They live inside an unfinished mall — basically a construction site-turned-displacement camp in the Iraqi Kurdish city of Erbil — with about 150 other families. Kids play soccer in one area, near latrines that the United Nations put up. Aluminum barriers create small cubicles for privacy for each family. But when winter comes, this place will be unlivable. Guerges says she doesn't know what she'll do. We don't have money, she says, no water heater. The family has two blankets for 10 people, and winter clothes cost money she and her husband don't have. "How will we survive," she asks, "when it begins to rain and freeze?" It is a question many are asking now. With winter approaching, the 1.8 million Iraqis displaced by forces of the extremist group, ISIS, face real danger with sub-zero temperatures. People are fleeing for safety, away from the battle raging between ISIS, also known as Islamic State, and the Iraqi government. Many have lost every belonging they owned and are forced to live under bridges, in unfinished buildings and tented displacement camps in the Kurdish north. Will Parks, head of UNICEF in northern Iraq, stands in a UN warehouse where boxes of supplies are stacked to the ceiling. He speaks to his colleagues about the distribution of hygiene kits, blankets, hypothermic kits and winter clothes. Parks and his team have been preparing for winter since June, when ISIS first steamrolled through Mosul. But even with all the preparation, they won't be able to get warm clothes and supplies to all the vulnerable families in need. "We are running to keep up," he says. In areas under ISIS control, from the western Anbar province to the northern city of Mosul, Parks says they can't reach families who've been displaced and need help. Those who have fled to safety but are living outside in open areas number about 170,000 in the relatively safe Kurdish north of Iraq, he says. Even if they distribute every piece of clothing and blanket they have, at least 50,000 children will be left in the cold. "We've got military situations all around us right now, and those are threats to life," Parks says. "But winter takes lives. It doesn't bargain. You can't push it back. You can't do airstrikes to prevent winter. Winter just kills children." It's a killer that can't be stopped. At the Baharka displacement camp on the outskirts of Erbil, the families know that. The tents are set up in a big lot of dirt and gravel that will turn to mud when the rain pours from the sky. Aid workers are trying to elevate the tents onto concrete, to prevent flooding. Fathi, a young policeman from Mosul who wouldn't give his last name for fear of retribution, fled four months ago, when ISIS took his city. Every night he cries. We don't want to be here for the winter, he says. We need a solution so we can go home. Leaders from the Anbar province of Iraq are asking Western forces for more help to stop the advance of Islamist fighters. They warned the area could fall to the group known as ISIS or Islamic State. Meanwhile a humanitarian crisis is growing. Winter is approaching, and with it, freezing temperatures. 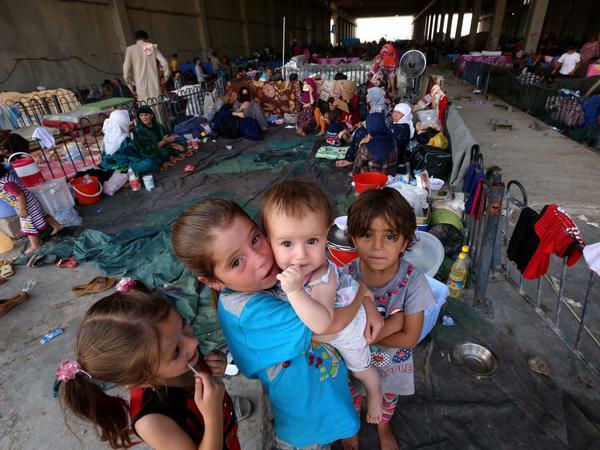 That presents a whole new set of dangers to the 1.8 million Iraqis who have been displaced. NPR's Leila Fadel reports on the looming crisis. LEILA FADEL, BYLINE: Leeza Guerges sits on the concrete floor of an unfinished building where she lives now. LEEZA GUERGES: (Foreign language spoken). 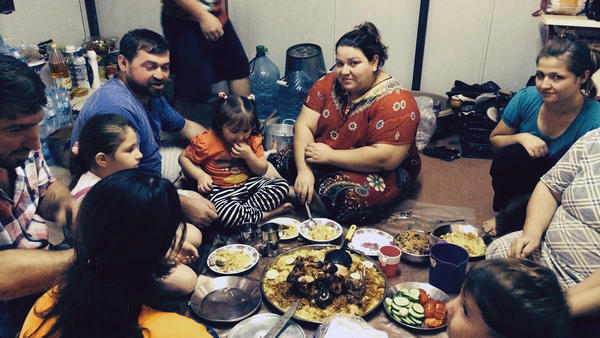 FADEL: She calls for her two kids, her husband and her in-laws to eat the eggs, meat and rice she's prepared. The meat was donated, and it's a rare treat for the family who was displaced from their home near the northern city of Mosul when ISIS took it about two months ago. They gather together on the floor and for a moment try to forget that they can't go home, and everything they once had is lost. They live inside an unfinished mall - basically a construction site turned displacement camp in the Iraqi-Kurdish city of Erbil with about 150 other families. Kids play soccer in one area near latrines that the United Nations put up. Aluminum barriers are erected to create small cubicles for privacy for each family. But when winter comes, this place will be unlivable. FADEL: Guerges says she doesn't know what she'll do. We don't have money, she says, no water heater. The family has two blankets for 10 people, and winter clothes are costly - money she and her husband don't have. FADEL: She asks how will we survive when it begins to rain and freeze? It is a question that so many are asking now. People are fleeing for safety away from the battles raging between the so-called Islamic State and the Iraqi government. FADEL: We meet Will Parks at a United Nations warehouse where boxes of supplies are stacked to the ceiling. He's the head of UNICEF in Iraq's north, and he and his team have been preparing for winter since June when ISIS first steamrolled through Mosul. But even with all of the preparation, they won't be able to get warm clothes and supplies to all the vulnerable families in need. WILL PARKS: We are running to keep up. FADEL: In areas under ISIS control, from the western Anbar province to the northern city of Mosul, Park says they can't reach families who've been displaced and need help. And then there are the families and children who fled to safety but are living outside in open areas. That number is about 170,000 in the relatively safe Kurdish north of Iraq. And even if every piece of clothing and blanket is distributed, at least 50,000 children will be left in the cold. PARKS: We've got military situations all around us right now. And those are threats to life. But winter takes lives. It doesn't bargain. You can't push it back. You can't do airstrikes to prevent winter. Winter just kills children. FADEL: It's a killer that can't be stopped. At the Baharka displacement camp on the outskirts of Erbil, the families here know that. The tents are set up in a big lot of dirt and gravel that will turn to mud when the rain pours from the sky. Aid workers are working to elevate the tents onto concrete to prevent flooding. FADEL: That's Fathi , a young policeman from Mosul, who wouldn't give his last name out of fear, fled four months ago when ISIS took his city - the city of Mosul. Every night he cries. We don't want to be here for the winter he says. We need a solution so we can go home. Leila Fadel, NPR News, Erbil. Transcript provided by NPR, Copyright NPR.